By the time I eventually sat down to work on the actual drawings I felt like a bit of a Churchill expert myself and the composition of the 6 scenes felt like a relatively easy choice. 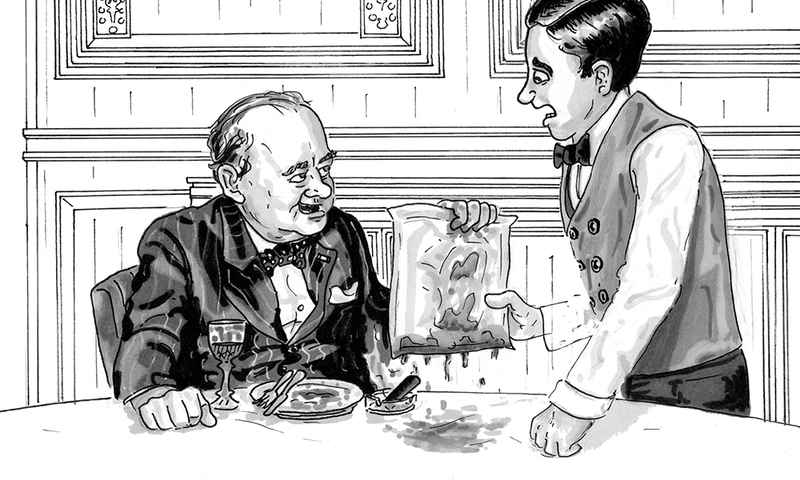 The first one I did was of a meal with Gladstone and Disraeli as guests at his table, with Charlie Brown the carver serving. Disraeli died when Churchill was a child so this meal would never have actually happened but I liked the idea of ‘What if it did’ and I imagined that Churchill would focus his attention on Disraeli and they’d both ignore Gladstone and make him feel uncomfortable! The six pieces will be displayed on the historic walls of Simpson’s Grand Divan from 8 November 2018.